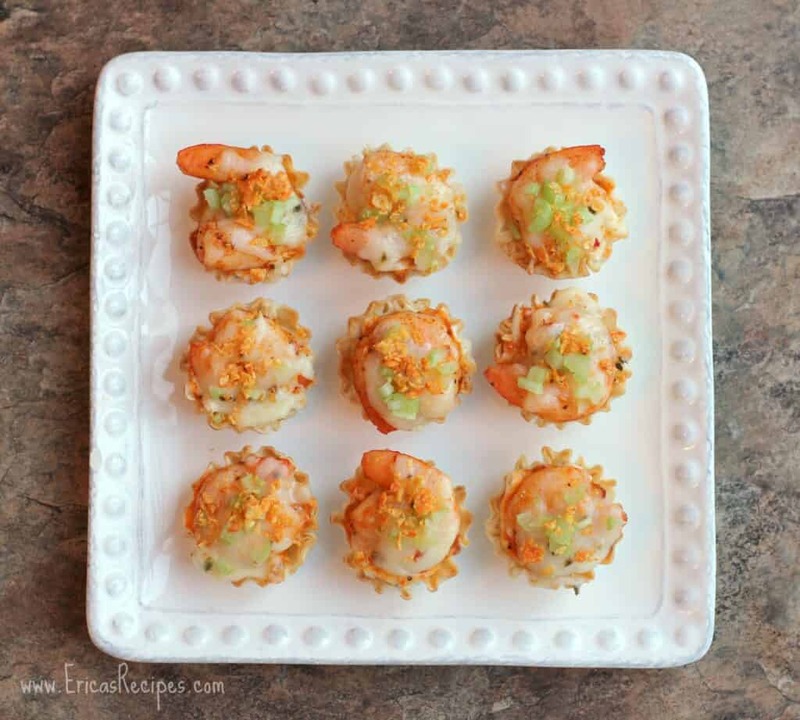 Buffalo Shrimp Bites are tasty party nibbles, that are as good to eat as they are pretty to look at. Top with crusted nacho chops for extra crunch! Planning for Superbowl food, my family requested “the usual”….Crack Bread, Queso, and L’il Smokies. Well, that’s no fun…I wanted to make up something, try something new! So I did anyway. I think I enjoy making apps and football food, finger foods especially, more than anything. These little bites are simply an adaptation of my Buffalo Chicken Dip, instead with shrimp and perfectly packaged for bite-sized noshing. And they prove that football food can be pretty too! Heat oven broiler on high heat. On a rimmed bake sheet, toss the shrimp in the olive oil. Season with salt, pepper, and Old Bay. Spread the shrimp in a single layer. Broil 1 minute, flip, and broil another minute. Toss the shrimp with the buffalo sauce. In a bowl, combine the cream cheese and ranch dressing. Gently spoon or pipe ~1/2-1 teaspoon cream cheese mixture into each fillo cup on a rimmed bake sheet. Top the cream cheese layer with a shrimp. 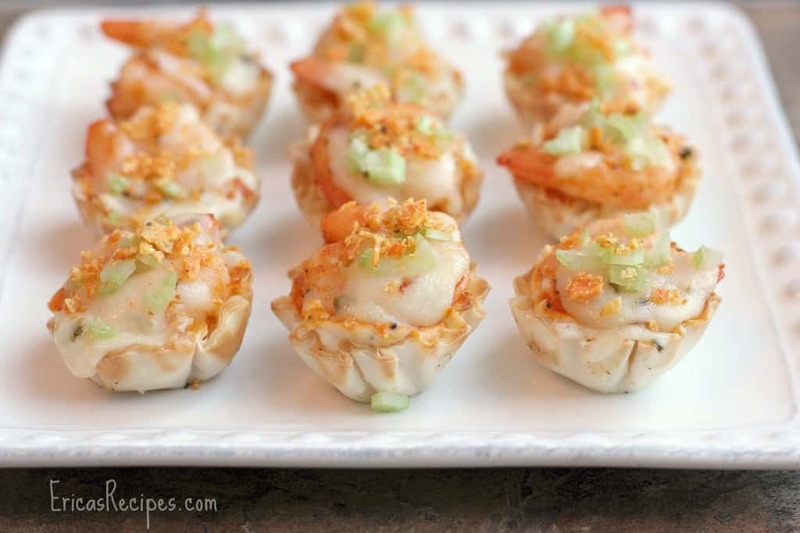 Top each shrimp with some cheese (cheese will spill onto the bake sheet - that's unavoidable). Bake the filled fillo cups for 8-10 minutes until cheese is melted and cups are heated through and a little bubbly. Remove from the oven and immediately top each with a sprinkling of celery and crushed Doritos (these will also get all over the bake sheet too). Serve warm. Yield: 30 appetizers. What adorable nibbles Erica!!! LOVE them so and shrimp is just one of my favorites! I LOVE buffalo shrimp. I prefer it to buffalo chicken. These look really good – what a great idea! Thanks for linking up to the Bloggers Brags Pinterest Party. I have pinned your post to the Bloggers Brags Pinterest Board. So cute! I’ve never had this combination before. Looks yummy! Love your new look, Erica! !